By Kori ~ June 7th, 2010. The WAWine World Tasting Event was last Thursday night. Hosted by 14 Washington wine writers including me, #WAWine (the eventâ€™s Twitter hashtag) was a virtual event designed to get people from all around the world simultaneously drinking and talking about Washington wine. Many thanks to Josh Wade of Drink Nectar for hosting, Washington Tasting Room Magazine and the Washington Wine Commission for sponsoring, and all of you who participated. The event was a success! We hosted a small gathering of friends for the event. We provided some of the wines from our own cellar and each couple also brought a bottle to share. We enjoyed ten bottles of Washington wine. 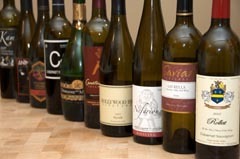 Those ten wines covered seven varieties, five AVAs, and a variety of price points. It was a good representation of the breadth and depth of Washington wine. To kick off the evening, we toasted Washington wine with a sparkling wine which was predominately Chardonnay, then moved to still white wine for a Riesling, and then had eight red wines including Cabernet Franc, a Sangiovese blend, Petite Sirah, Cabernet Sauvignon, and Syrah. 2005 Chateau Rollat â€œRollatâ€ Cabernet Sauvignon (Walla Walla Valley, Washington): 80% Cabernet Sauvignon, 15% Merlot, 5% Cabernet Franc. Deep, dark red. Stunning nose with black fruit, oak, cedar, and pencil lead aromas. Blackcurrant, black plum, earth, and a touch of chocolate come through on the palate. Medium to full-bodied and lively with medium to high tannins. Well-balanced and complex with a long finish. 2006 Saviah Cellars Laurella (Columbia Valley, Washington): 51% Sangiovese, 33% Cabernet Franc, 16% Merlot. Dark, inky, purplish red. Beautiful bouquet with black and red fruits on the nose; more red and black fruits, sour cherry, and spice on the palate. Medium to full-bodied and crisp with medium to high tannins. Good mouthfeel, well-balanced, and a long finish. 2008 Nefarious Stoneâ€™s Throw Vineyard Riesling (Columbia Valley, Washington): Estate grown fruit. Pale gold in color. Dried apricots come through on the nose; Granny Smith apples and white peach on the palate. Off dry, medium-bodied, long finish. Very crisp, smooth, and well-balanced. A great sipper and also excellent with food. 2007 Hollywood Hill Vineyards Rattlesnake Hills Syrah (Rattlesnake Hills, Washington): Dark, purplish red. Very aromatic with black fruits, pepper, spice, and smoked meats on the nose; black fruits, beef jerky, spice, and black pepper on the palate. Medium to full-bodied and crisp with medium to high tannins. Well-balanced and smooth with good complexity and a very long finish. 2005 Camaraderie Cabernet Franc (Washington State): Deep, ruby red in color. Black fruit, spice, and vegetal aromas. Flavors of black fruits and spice with pronounced green pepper on the finish. Medium to full-bodied and lively with medium to high tannins. Well-balanced with a long finish. NV Domaine Ste. Michelle Blanc de Blancs Sparkling Wine (Columbia Valley, Washington): Pale, greenish straw yellow. Very aromatic with citrus and grassy notes. More citrus fruits, lemon zest, and some minerality come through on the palate. Dry, medium-bodied and crisp with small, fairly fast bubbles, and a long finish. 2007 Substance Cabernet Sauvignon (Columbia Valley, Washington): Dark, ruby red. Nice nose with black fruit aromas. More black fruits and a hint of leather on the palate. Medium-bodied and lively with sweet tannins and a long finish. 2005 McKinley Springs Syrah (Horse Heaven Hills, Washington): Dark, purplish red. Moderately aromatic with mocha, ripe fruit, and vegetal aromas. Black fruit flavors. Medium-bodied and lively with medium tannins and a medium finish. A weeknight wine. 2007 Animale Petite Sirah (Yakima Valley, Washington): Dark, inky purple. Stinky feet and Kool-Aid on the nose; red and black fruits up front but flavors trail off on mid-palate. Medium-bodied and lively with soft tannins and a medium finish. 2007 Kamari Cabernet Franc (Columbia Valley, Washington): Deep, purplish red. Bacon, smoke, and oak on the nose; good fruit up front but fades off. Medium-bodied and lively with medium tannins and a long finish. Very different than most Cabernet Francs. Over-oaked and plain. Sounds like a great party! Thanks for being such a fantastic teammate in this! I really appreciated your support! My pleasure. Thanks again for putting on such a great event. Cheers! Hi Kori – thanks for including us in the tasting. We also really appreciate all the support from the ‘peeps’! You are most welcome. Keep up the good work! Cheers!